What is Cloud Sprawl and How to Control it? "What is Cloud Sprawl and How to Control it?" Cloud sprawl is becoming a big problem for many operations. Does your organization is also facing a cloud sprawl problem? 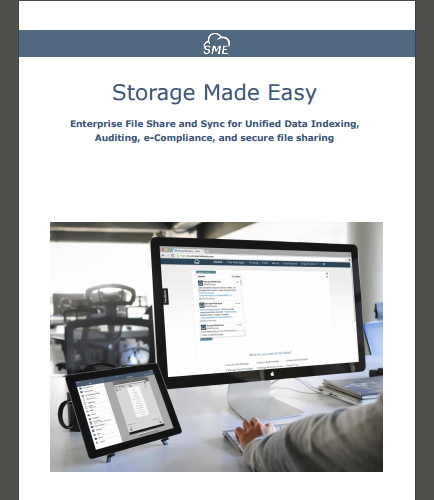 This whitepaper will guide you to deal with ever-growing use of public cloud services and apps by individuals within a company (commonly refrerred as "Cloud Sprwal") using an enterprise File Share and Sync solution for Unified Data Indexing, Auditing, e-Compliance, and secure file sharing. What is Cloud Sprawl and why you should be concerned about it? How to take back control of ‘Cloud Sprawl’ in your Company? How to avoid creating cloud silos that contributes to the Cloud Sprawl that you are trying to control?